Environment: Found in crevices in granite. 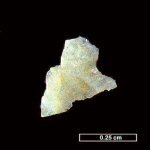 May be equivalent to evensite or varisite. Locality: Pontevedra, Spain. Link to MinDat.org Location Data. Name Origin: Named for Ignacio Boivar Y Urrutia (1850-? ), Spanish entomologist. Color: Greenish white, Yellow green. Luminescence: Fluorescent, Short UV=bright green. note: Specific Gravity of Bolivarite =2.01 gm/cc. U=PEBolivarite x rElectron Density= 2.46 barns/cc.